Are you stuck? Looking for a unique and meaningful anniversary gift for your spouse? 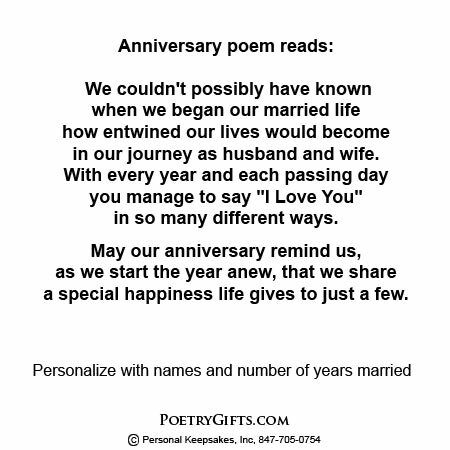 This Personalized Anniversary Poem for your wife or husband expresses tender feelings and helps create the perfect mood to celebrate your anniversary. Personalized with names, an optional date, and a loving message from you. 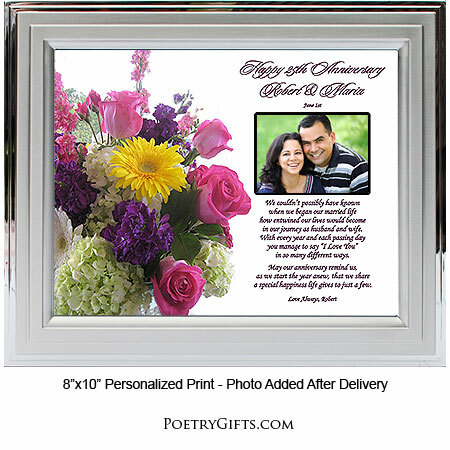 Add a favorite photo and this Poetry Gift becomes a cherished keepsake for your partner. "Together Forever and Ever" that feeling is what makes celebrating an anniversary so special. When you give a personalized anniversary gift to your husband or wife it says, "I care enough to take the time to find a gift that's meant just for you." 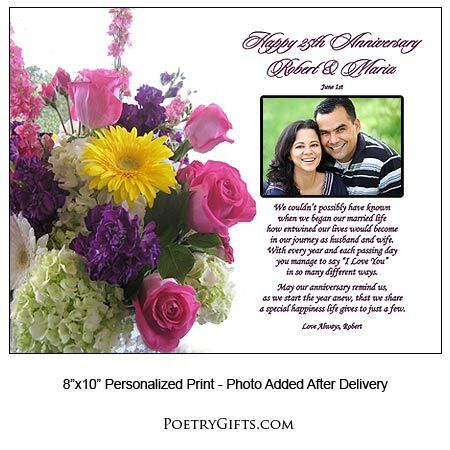 We created this original poem in a beautiful floral bouquet design because what's a more romantic present for an anniversary than flowers and poetry? This heartfelt anniversary poem can also be considered a "Marriage Love Poem." Frame it yourself in any standard 8" x 10" picture frame or we can do it for you in either our modern black wooden frame or our classic silver metallic frame. 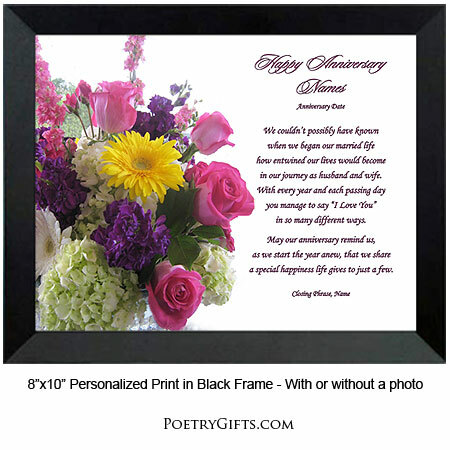 ($19.95 is the unframed price) Answer the personalization questions above and we will create an anniversary keepsake that your wife or husband will love because it came from your heart. 4. Closing Phrase and Your Name (as seen after poem) - (Examples: Love Always, Anthony; With Love, You're Number 1 Guy; All My Love, Alicia; etc.)" in our journey as husband and wife. a special happiness life gives to just a few.